Episode 41 – Who is a Byzantine? 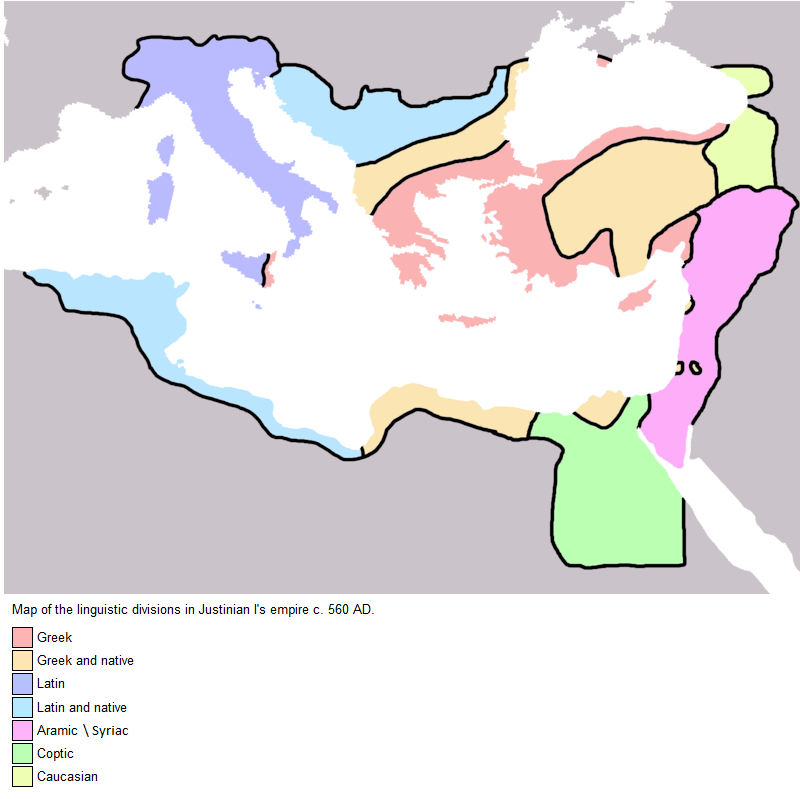 Map: The map shows the theoretical linguistic distribution of people in the Byzantine Empire around 560 AD. Download: Episode 41 – Who is a Byzantine? I so agree with your answer to the Question (with a Q writ large) about how the “Byzantines” saw themselves. They were Romans no matter their “affinities”. And yes, the Roman empire lasted until 1453, or if you really want to stretch it, until 1806 when Emperor Francis II finally “dispatched” it for certain, by dissolving the so-called “Holy Roman Empire of the German Nation” imperial title, which, as you know, was described by Voltaire as neither “Holy, nor “Roman” nor an “Empire”. It went through various perturbation, in territory, naming conventions, etc. but the “Romaness” was never lost on its leaders. The inhabitants of this agglomeration rapidly lost their sense of being “Romans”, but the leaders clung to it, as noted above, to the bitter end. Fascinating, how one civilization’s concepts and influences can last so long. I guess China is the only other example on this planet. 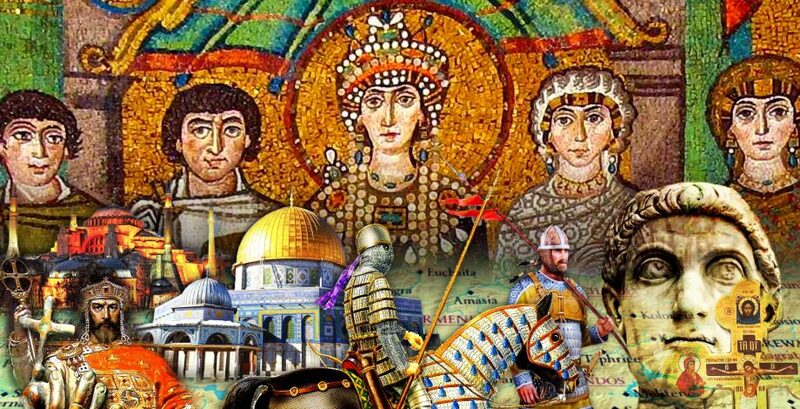 Being an avid “Byzantinist” I believe that what you are doing with the podcast is providing an invaluable service in promoting the understanding of this, so fascinating history. Great episode to finish the year. Wishing you a merry Christmas, Robin. Thanks again Robin. Plugging it as usual on google+ community. Merry Byzantine Christmas !!!!! Thanks so much guys 🙂 Happy holidays to you all. This is a wonderful series. Thanks for all your time put into it. It is very good at updating my historical perspective and detailing out some vague areas of my historical knowledge. But I have to ask, why are you still calling this The History of Byzantium? After a whole session devoted to debunking the idea of a “Byzantine” Empire and describing the Romans of “Romania”, can’t we just do the right thing? Maybe we could call it The History of Rome, the last thousand years. Having a Byzantine Empire may have been convenient for a historian or two hundreds of years ago, but is it valid for today? I think it distorts history for the rest of us. Byzantine Christmas is with the old calendar which is on the 7th 🙂 On the matter of the use of the Term “Roman” for modern Greeks, even today “Ρωμιός” is still a term used by Greeks today to describe themselves. A classic 1970s song “Ρωμιός αγάπησε Ρωμιά” Translates to “A Roman man fell in love with a Roman woman”. Thank you for another great episode and for your in-depth discussion of the Byzantine/Roman topic, which is somewhat of a pet peeve of mine. I frequently remind myself to visit the blog more often, but alas. I’ve enjoyed browsing back through the posts I’ve missed, and watching the selection of images and maps. Thanks for your continued work on this project! I just listened to this episode after being directed to your website by an enthusiastic friend of your work. It is truly excellent. I teach Byzantium at uni and use much the same line of argument, mostly based, like you, on Kaldellis’ work. You have, however, presented K’s argument better than I ever have. Thank you. I am going to my tutorials in a few hours to discuss your podcast with my students to whom I have assigned it as an expansion on my first lecture. I hope a few new listeners to your blog will come out of this. I enjoyed your podcast immensely but I question the veracity of the Byzantine peoples self identification a bit, and mostly because like you I see history through my perspective and how it applies to my present time. So, yes byzantine was multi ethnic, yes assimilation takes its natural course with some ( but not all) after being conquered for a century or two, and yes- I do agree that Rome ceased to be a city and went on to become a world in itself. Yet, I take a look at Spain currently,and what’s happening within its autonomous regions who have shared a nation’s history for about 1500 years after the fall of Rome, and after all that, you hear ” we have never been Spaniards, we have our own culture, etc etc” and its not just Spain but I hear it from Ukraine lately ( between the more Slavic Russians and the more polish Westerns), Chechnya in Russia, or even the post ottoman nations that formed after . I just don’t think the topic is so simple as saying that “Byzantines saw themselves as Roman”. Especially when you have cohorts of Avars attacking on monday, Persians on wednesday, and new emperor by Friday, oh and ‘ Father, hurry up with service because my daughter and wife just died from mutated H1N1 virus and I still need to chop wood by sun down”. My point is that everyone is happy and on board when they’re with the winning team ( or at least if they get to the world cup) but all bets, self identification, and loyalty are off when otherwise as I seem to notice today. Hi, thanks for the feedback. I take your last point seriously and I did try to cover it within the podcast. Of course the poor would always be at odds with the rich and not necessarily feel kinship or loyalty with them. But that doesn’t mean that they would identify themselves as being from a different nation. As for your first point I think there are two things to say here. 1) is yes of course some regions have always felt they were different. The Basques, due to their inaccessible geography, were feeling independent even in Roman times. But I did talk about the Isaurians, the Jews, the Samaritans, the Armenians and so on. I don’t see why that stops someone from the Balkans or someone from Egypt thinking of themselves as Romans. Just as someone from Alaska or Florida could be an American. 2) a lot of modern nationalism will look back to the past and try to draw things out which support their present-day desire for independence. And in the case of Ukranians or Catalans there may be truth to it. But we shouldn’t look at the Romans and assume they thought as we did. We can only go on the archeology and the written history which give little hint of modern nationalistic sentiment amongst “Roman” citizens. Remember that all I’m arguing is that their self identification was as the Roman people. That doens’t mean that people from the Balkans didn’t make disparaging remarks about Egyptians or vice versa. They were people just as we are. But the question is did they really think they were Egyptian or Illyrian rather than Roman and I’m saying no. Robin, I enjoy your podcast but this episode on Who Is a Byzantine was easily one of the most thought-provoking, eye-opening podcasts I’ve ever heard. More than anything else, I loved the anecdote of the Greek island boys in 1912 saying “We are Romans.” I stopped what I was working on and came in to tell my wife about it. I shared it with my extended family in our weekly online chat. It was just a marvelous example of the weight of history being felt into modern times. Thank you. That was exactly how I reacted when I read it 🙂 I’m glad I could pass on the same effect. Thanks for writing, really appreciate it. I also was stunned by the story from 1912. In fact, I’ve replayed this couple minutes of this fascinating podcast about 4 times. Just incredible! Thanks for all the work that must go into producing such a great podcast. I agree completely, I got a chill when I heard that story and went back again later to listen to it. What was the name of that reference? I would love to read more about it. Great work! Excellent 🙂 The quote comes from a book called “Hellenism in Byzantium” by Anthony Kaldellis. But the story is about Peter Charanis who has written books on Byzantium himself. I think you make as compelling a case as possible for Roman continuity through the Byzantine era, which is another way of saying that you would answer that question by suggesting it’s a false dichotomy. There is, of course, an opposing view in current scholarship: Historian Peter Heather has spoken of a “decisive break in east Mediterranean Romanness” coincident with the rise of Islam (The Fall of the Roman Empire, 2005, pp. 431-32), based on archaeological evidence, a sentiment that colleague Bryan Ward-Perkins seems to share to some degree. Myself, I think it’s a close call. A community’s self identification simply cannot be dismissed (which too many Western figures did for too long), but neither can it be dispositive by itself. The “Byzantines” (we all concede the anachronism of the term) certainly *did* think of themselves as “Romans,” right to the very end – and beyond! But to what extent did that term mean the same thing as that understood by self-identified Romans of the Republic, or the Antonine Age, or even that of Theodosius the Great? What does it really mean, in fact, to be a “Roman?” What does it mean to live as a “Roman?” There is, as Heather notes, a great many notes of very real rupture in the 7th century; at the same time, the very least we can say is that Byzantium has a claim to being a successor state to Rome in a way that no other entity or society can really maintain. There is, after all, a direct line of unbroken imperial succession at Constantinople, using the same legals codes, right up until 1204, something which does not exist anywhere else. It remains…a difficult and fascinating question. Your podcasts are a fantastic series, and I hope you will keep them up for a long time to come. Thanks for the kind and interesting comment. As you say there are many points at which the Roman world would have appeared hugely changed to someone of a previous era which calls into question the continuity of identity. Certainly from my reading I would be sympathetic to the argument that once the government moved to Constantinople the culture of that city was its own organism. And the people who governed there knew the rhythms of that city and assumed it was “Romanness” in a way that Romans of the past would not recognise. One of the best books I’ve read is by Mark Whittow (The Making of Orthodox Byzantium). His argument is that the Byzantine state disconnected itself from the rest of the potential “Roman” world during the struggle over Iconoclasm. Because the dispute over icons was limited to only the central Empire itself it meant very little to the Christian communities in Italy, Africa and the East. And of course absolutely nothing to the Catholic west. His point is that after all the doctrinal and political fighting and rewriting Christians from outside the Empire would no longer be able to identify themselves with the religious life of the Empire. So in a sense that whole dispute isolated Byzantium as its own civilization incapable of easily assimilating people who used to be a part of the Empire. Thank you for the kind reply. I very much appreciate the reference to Whittow, since it highlights one difficulty for Roman continuity not addressed by Heather (since it is outside his period of study), to wit: That there is a marked insularity that seems to characterize the empire of the Isaurian dynasty going forward, which largely survives even into the Macedonians (to say nothing of later days). The Empire of those days could and did incorporate Isaurians, Armenians, Paulicians, and even some Bulgars and Slavs, but it seems to have lessened assimilative powers than the Empire of Late Antiquity did, and not just because of the hardening identity of Byzantine Orthodoxy (although Whittow seems correct in suggesting that the latter played a key role). Yes, it’s possible that, had John I Tzimiskes or Basil II lived longer, Byzantium might have re-incorporated, say, Sicily or Palestine. But one doubts they could have held either for very long, even with capable successors. As Warren Treadgold suggests, for all of the impressive vitality of the Macedonian empire, there was sense in which it had really reached its natural limits by 976-1025 – limits that largely coincided with the core of the old Hellenistic world. Reacquisition of its old Latin and Semitic realms seems to have been beyond its powers by that point, and not just because of the resistant powers of Islam. Does this answer the question? Not entirely. I think that the Byzantines had the right to call themselves whatever they liked, to define their identity, and that the historiographer is obligated to take that self-identification into account. There is no one change in the empire (in capital, in language, in religion, in urbanization, in economy, or administration) in the transition from Late Antiquity to the Medieval that is fatal to the case of continuity; taken all together, however, they make it, as I said, a close call. Given the emphasis of current revisionists on looking at the case for rupture again, your argument is a helpful balance in the discussion. The Turks, both Seljuq and early Ottoman, called Anatolia “Rum.” So did Persian Muslims. Even after the partial Islamicization of much of Anatolia, actual Muslim residents of the area were called “Rumi” and *saw* themselves as “Rumi” Hence, of course, the Sufi poet Jalaludin Rumi. One would presume that an Afghani poet being known to posterity as “Rumi” would seal the argument. So here, not only did the Byzantines see themselves as Roman and their nation as Rome, but their neighbors and most intimate civilizational rivals and enemies, who later supplanted them. After the Turkish conquest of Constantinople the entire province still was called Rumeli – Land of Romans – for a very long time. In other words there was total continuity of self-identification as Roman, and outsider identification of the inhabitants of the territory as Roman, even after the actual true fall of Eastern Romania. Now, someone above mentioned a modern comparison to America. I completely disagree that we should automatically and reflexively assume that people then saw themselves and their nationalities in a similar way. It may be the case, and it may not be the case, but there is no room for an a priori assumption there. But that said, in this case, there is an excellent case for the continuity of some sort of inchoate Roman identity, to varying degrees of strength, and for arguing that the only people to ever see these people, their nation, and empire as “Byzantines” are modern North-Western European scholars with some self-perceived debt to a Western Latin identity. It would be as if long after the actual fall of the government of the United States of America, inhabitants of North America still called the land America and saw themselves as ‘American” in some sort of sense. We shouldn’t assume, in this sort of sci-fi dystopian scenario, that what they *mean* by “America” would correspond to what what *we* mean by it today. But there would be, on some level, more continuity than not. Sure, this is a fair point. But in the end, it remains a variation on the argument that the Byzantines saw themselves as Romans – we’re just looking at a different contemporary set of observers making the observation. But if it is really true, as I and Heather might contend (and as Robin at least muses might be true up above), that the (post 7th century) Byzantines were no longer able to recognize how different they and their culture had become from Roman society as it existed up through Late Antiquity, how much less able were Arabs or Turks (who were truly alien cultures) to offer such an assessment? Is it not possible that the greatest reason the Arabs called them “Rumi” simply because the Byzantines were calling themselves Romaioi? I think it’s also telling that other cultures which could claim some lineage from Rome *did* start calling the Byzantines something other than Romans – namely, most Western Christians, who called them “Greeks.” Now, the Latins often had self-interested motives for saying so, but they also were uniquely advantaged in having some genuine cultural descent (albeit somewhat more removed) from Rome by which to assess what the Byzantines had evolved into. The point is not there is *no* continuity between Roman society and post-7th century Byzantine society – there was, and not just in occupying the same real estate and buildings. But I think Heather is right to say that what had been merely cultural development of Roman society up to that time became a real rupture under the Heracleans. The result was Rome’s one true successor state, but a successor state is what it really was. Even if the Byzantines and some of their neighbors failed to perceive it. Just got to this point. After listening to the entirety of tHoR twice and to this point in tHoB, I will say this is the best podcast of any of them. Simply fantastic work. Thank you. Very interesting podcast about the Byzantine identity. By the way you may forgot to mention that at least the educated “Byzantines” and the church were aware of the classical Greek literature and after the 4th crusade they have started identifying themselves also as Greeks. Plethon Gemistos was one such figure who created the Neoplatonic philosophical school and debated a lot at his time in reviving the Greek identity and establishing a Greek kingdom in South Greece since the fall of Constantinople to the Turks was becoming more and more clearly inevitable. I recently discovered the podcast and I am enjoying it very much. Regarding this episode, “Who is a Byzantine”, I would like to remark that Robin’s example of early 20th century “Romans” resonates with me very much. Part of my heritage comes from a small ethnic group in Ukraine, represented by two sub-groups, Urums and Rumei. Both ethnonyms mean the same thing, “Roman” in different languages, and both ethnic groups trace their origins from the populations of Byzantine Empire. In this sense, the descendants of the Byzantines live on in the 21st century, describing themselves as “Romans” to this day. My great uncle came over from Greece within a generation of Peter’s story if not around that very time, though was born in Asia Minor just before the turn of the century. I will have to do some research of my own to see if the family name drips with Roman blood beyond our Italian ancestors. In a very late (5 years) addition to the roman/byzantine self-identification discussion, I would remember that nationality is at least an XVIII century construct. Being Romani wouldn’t mean the same to a VI century man as it means to us today, and there wouldn’t be the same care for identity in those times as today. What there was, was an allegiance towards your city or region, which also explains the parallel diplomacy of the cities you can see in the wars with Huns, Bulgars, Persians, and in the future, Arabs. But there would be something to unite roman citizens from different cities, I propose that the allegiance to the city carries to the empire, as the city is part of the empire, where a unifying law system existed and ways to behave were expected. Recognition of belonging to the bigger roman empire would still be important but mediated by the loyalty to the city. Also, as Mike D. and Robin have taught me, a common roman identity would exist in the assertion of Christianity and Orthodoxy, and the special role of Rome on its history. Thanks to all. What a great community you have created here Robin.